A maiden flight of sorts for the lone configuration of the Delta 4 rocket that has not yet been utilized will take to the skies from America's western spaceport Tuesday (April 3), weather permitting, on a mission carrying a classified spy satellite. 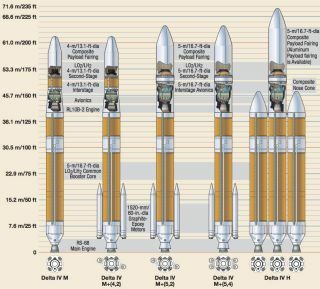 Comprised of medium- to heavy-lifting vehicles, the Delta 4 rocket family has five members with increasing levels of performance for hauling larger and more massive payloads to any desired orbit. Since debuting in November 2002, rockets with no strap-on solid motors, some with two boosters and others with the maximum of four, nose cones in both 4- and 5-meter diameter options, and the mighty triple-barrel version with three core stages strapped together have flown successfully. File image of the first Vandenberg Delta 4 rocket being lifted upright at the SLC-6 launch pad. All of the elements have flown before, repeatedly racking up successes, such as a Medium with two solids but a 4-meter nose cone, or earlier this year when a 5-meter shroud flew with four solid motors. But this specific "5,2" configuration is the last one left to prove in spaceflight. "As the first-ever Medium+ (5,2) mission from either Cape Canaveral Air Force Station or Vandenberg Air Force Base, this launch represents a significant milestone in Delta 4 operations for the nation," said Lt. Col. Brady Hauboldt, the 4th Space Launch Squadron commander and the Air Force launch director. "It provides final flight verification for all five variants of the Delta 4 rocket and marks the capability of delivering payloads of all sizes and weights to orbit. It is the 19th overall Delta 4 launch until the EELV program since 2002." Development of Delta 4 began in the mid-1990s under the Air Force's Evolved Expendable Launch Vehicle program to carry military and civilian spacecraft of all shapes and sizes from both primary U.S. launch sites. All five configurations in the family feature a Common Booster Core first stage with the Pratt & Whitney Rocketdyne-made RS-68 liquid hydrogen/liquid oxygen main engine and an upper stage with PWR's RL10B-2 cryogenic engine. What separate the different variants is the use of either two or four Alliant-made strap-on solid rocket motors and the selection of the nose cone diameter to enclose the satellite cargo during ascent through the atmosphere. The solids are larger, more powerful cousins to the Delta 2 and Delta 3 rockets. As its name suggests, the Common Booster Core first stage is "common" across all Delta 4s. A CBC measures about 150 feet (38 meters) in length, 16 feet (5 meters) in diameter and weighs 54,000 pounds unfueled. Looking from the bottom to the top, the RS-68 power plant and engine section are at the base of the stage. The liquid hydrogen tank accounts for about two-thirds of the stage. That portion of the CBC is covered by orange foam insulation. The white band is the known as the centerbody. The next orange section is the first stage liquid oxygen tank. Manufactured by Alliant Techsystems, these third-generation graphite-epoxy motors are advanced and larger versions of the boosters from those previously developed. The Delta 4 motors are dubbed GEM-60s because they are 60 inches (1.55 meters) in diameter. They can fly with nozzles that are either fixed or can swivel, gimbaling through hydraulics to help steer the rocket in flight. The average thrust produced by each booster is 195,000 lbs at vacuum. For the Delta 4 Medium and Medium+ 4,2 rockets, an interstage adapter that tapers from the five-meter first stage to the four-meter upper stage is used to join the two stages of the rocket. The Medium+ and Heavy rockets with 5-meter upper stages have a straight barrel-like interstage. The RL10B-2 engine, equipment shelf and liquid oxygen tank are hidden within the rocket's interstage during launch. Once the first stage has completed firing, it and the attached interstage are jettisoned to reveal the RL10. As seen on the launch pad, the top band of foam on the rocket is the upper stage liquid hydrogen tank. The stage carries about 45,000 pounds (20,400 kg) of propellant for a total burn time of around 14 minutes. A normal mission to geosynchronous transfer orbit features two firings. For the bigger members of the Delta 4 family — Medium+ (5,2), (5,4) and Heavy — the stage is enlarged to five-meters in diameter in order to carry more propellant. The oxygen tank is lengthened by a half-meter and the hydrogen tank goes from four to five meters in diameter. The total fuel load is increased to 60,000 pounds (27,200 kg), extending the stage's firing time to nearly 19 minutes. The RL10B-2 engine — developed by Pratt & Whitney on decades of RL10 heritage — has the world's largest carbon-carbon extendible nozzle that drops into place just after the first stage falls away. The cryogenic engine produces a thrust of 110 kN (24,750 pounds) and a specific impulse of 465.5 seconds. It has a total service life of 3,500 seconds and 15 starts, including ground testing. Atop the upper stage sits the payload attach fitting and the satellite cargo enclosed within the fairing. The nose cone can either be 4- or 5-meter composite shrouds or a 5-meter aluminum fairing that dates back to the Titan 4 rocket.